Excellent all the way! From complimentary airport pick up, to check in, to facilities, to bed, to delicious and delightful breakfast served at door step, to check out to complimentary drop off at airport! Never experience TOTALLY FREE minibar in any other Resort/Hotel other than this with branded stuff. Private Pool. Breakfast menu options. Free snacks. The Villa is AMAZING. The overall design, the pool, the interior decor and everything about that villa was great. Even the bathroom is really cool. Breakfast was also really good. Room amenities, as far as complimentary supplies was great. Beside the usual water, tea and coffee you get some crackers, Pringles, chocolate (snickers and bounty and a couple more full bars), small cereal boxes, a couple of small milk bottles, few soda cans and a couple of beer cans. So you are covered for snacks through out the day. AND they refill all that everyday. Another cool feature I found to be pretty nice, was the availability of hotel cars to transport you anywhere you like within the island and back to the hotel anytime you like. Staff are very helpful and make your stay that much more pleasant. It is an awesome place to stay for anyone who are looking for an escape from hectic life. The environment and the surrounding of the villa is really calming and beautiful. The villa is very well maintained with added facilities and the pool is just so perfect! we liked everything about our stay. The staffs are so friendly and helpful. The villa management also do provide free pickup & drop off during your stay and additionally free shuttle to Chenang Street which was very good for travelers without a vehicle. Will definitely come back!! The staff are extra extra extra friendly, all of them, the drivers Mohammed Azzam and Abdulrahman were the best. It was a very good experience, the complimentary pickup from the airport, the rides to next hotel, the flowers at the aisle leading to the villa, the in villa check in/out, they are welling to serve you the minute you call, the driver always there when you want to go out, the gadgets provided at the bathroom everything was there even a hair tie, the spacious bathtub, the complimentary laundry service, TV quality was good and nice variety of channels, the hammock, the honeymoon arrangements, and again the very nice staff. Everything was as booked from website, Excellent Breakfast, Housekeeping, Bed, Swimmingpool, host, pickup and dropoff from and to Langkawi Airport.. Unforgettable times in La Villa. Highly recommended for Honeymooners and Couples. Lock in a great price for La Villa Langkawi - Private Pool – rated 9 by recent guests! One of our top picks in Pantai Cenang.La Villa Langkawi (Private Pool) is a modern one-bedroom property with its own private pool and balcony overlooking lush greenery. 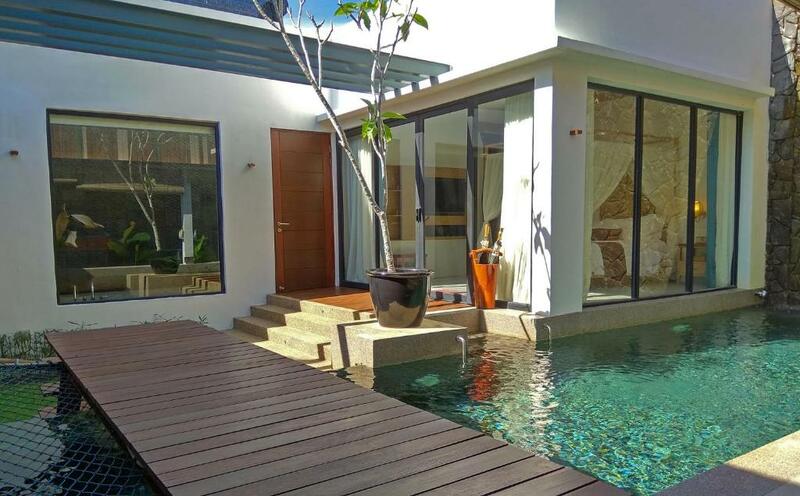 A 3-minute drive to Pantai Cenang, the villa provides free Wi-Fi and free parking. It is 1.1 mi to UnderWater World Langkawi and The Zon Duty Free, while Cenang Mall is 1.2 mi away. Kuah Jetty and Sky Cab Langkawi are 12 mi from La Villa Langkawi. The villa’s air-conditioned room comes with a private bathroom. A flat-screen satellite TV, safe and seating area is included. A private balcony overlooks lush greenery while a refrigerator, microwave and electric kettle are provided in the kitchenette. Guests can approach the 24-hour front desk for bicycle rentals and car hire. Alternatively, guests can explore the surrounding area for a variety of shopping and dining options. When would you like to stay at La Villa Langkawi - Private Pool? 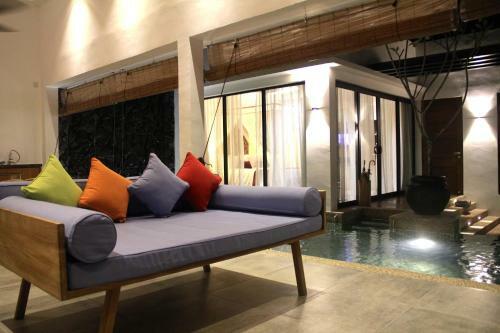 This air-conditioned one-bedroom villa features a private pool. The seating area is fitted with a flat-screen satellite TV and a sofa. A private balcony overlooks lush greenery while a refrigerator, microwave and electric kettle are provided in the kitchenette. The private bathroom includes shower facilities, a hairdryer and free toiletries. This villa has a balcony, toaster and dining area. La Villa is perfectly situated in the quiet and beautiful beach village of Pantai Tengah, near Pantai Cenang. It is 800 metres from Pantai Cenang’s best restaurants, bars, beaches and surf spots. Pantai Cenang hosts the island’s best food, shopping destinations and nightlife while the downtown, Kuah is a short 20 minutes away. There are two 1 bedroom villa with a private pool each. House Rules La Villa Langkawi - Private Pool takes special requests – add in the next step! One older child or adult is charged MYR 80 per person per night in an extra bed. La Villa Langkawi - Private Pool accepts these cards and reserves the right to temporarily hold an amount prior to arrival. Please inform La Villa Langkawi - Private Pool of your expected arrival time in advance. You can use the Special Requests box when booking, or contact the property directly using the contact details in your confirmation. The villa was really amazing.. more than we expected.. very relax and calm.. the staff also friendly and comfort. We loved every thing about La Villa, starting from the pick up at the airport until the check out. The staff were really welcoming and helpful. The villa was spacious, very clean and the pool was amazing!